Irish Lavistown Sausage And Chicken Dinner (serves 6) | Crappy Kitchen - Good Dinners! This dinner was all about the sausages we bought the other day in Kilkenny. We first tasted them in a pub in Thomastown (will be writing about this particular pub in the near future!) and my sister told me they were local. There is nothing like eating food close to the source, especially when it comes to meat. Lavistown Gourmet Sausages hail from Lavistown House in County Kilkenny in Ireland. 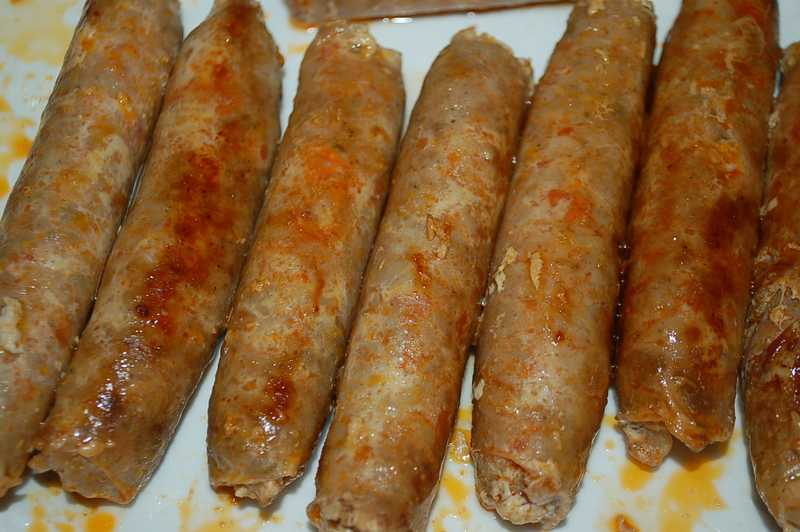 They have been making these lovely meaty sausages from locally sourced pork (no fillers!) for the past 21 years, and after eating them, it will be impossible to buy run-of-the-mill sausage links in the supermarket ever again! unctuous sausages from County Kilkenny! We used their Italian Style variety and cooking them first on the pan, which released their beautiful flavor, and finishing them off in the oven with wine and thyme brought out a deliciousness my taste buds won’t easily forget. If you live anywhere near Kilkenny these sausages should be a weekly staple for breakfast, lunch and dinner! 1 – Put large saute or roasting pan on medium heat and add oil. Add sausage and cook until browned on all sides. Remove to a plate and set aside. 2 – Season chicken with a light sprinkle of sea-salt. Turn heat up slightly and brown the chicken fillets on both sides (they will soak up the flavor of the sausage juices and oil). Remove to a plate and set aside. 3 – Add onions, celery and thyme to pan and cook for 10 minutes, stirring occasionally, and adjusting heat so as not to burn the vegetables. 4 – Add the potatoes and continue to cook for another 4 or so minutes. The potatoes will begin to brown. 5 – Turn heat up and add the wine. When it comes to a boil, cook for about 2 minutes, stirring and scraping up the brown bits stuck to the bottom of your pan. Add the broth (or bouillon & water) and bring to a boil. Add the meat in an even layer. Turn heat off, cover pan with lid and place in preheated oven for 30 minutes. Serve this with whatever you like. Some of us had it with lots of field greens, while others loaded up on more carbs in the form of basmati rice. This entry was posted in dinners, Ireland and tagged chicken, Ireland, irish sausages, kilkenny, lavistown house, lavistown sausages, locally sourced pork sausages. Bookmark the permalink. Thanks for the blog mention – now we have to try it! Pingback: A Yummy Sausage and Pasta Dinner – Quick! (serves 6) | Crappy Kitchen - Good Dinners!